Detective fiction is one of my favourite genres. I grew up solving riddles with Hercule Poirot and Nancy Drew, while rooting for Jessica Fletcher in Murder, She Wrote, and becoming acquainted with Sherlock Holmes. The roots of my fondness for detective fiction probably lie in Enid Blyton’s The Famous Five. Four children and their faithful dog stumble upon more mysteries than any normal child ever would, in increasingly dangerous and exciting situations that most parents would never let their children amble into. Of course as a child I never questioned this, but just enjoyed the endless adventures and puzzles that kept the five friends busy, wishing I could do the same. But with the help of the German audio plays and later the original English texts, I was able to play detective vicariously. Along with Nancy Drew and Poirot, Miss Marple, the Beresfords, Simon Templar, and Philip Marlowe walked into my life. 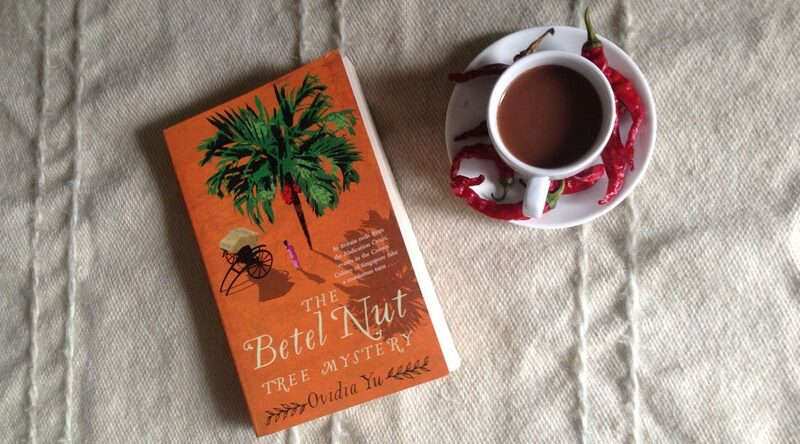 The atmospheric settings, eccentric characters, and brain teasers that accompany mysteries absorbed me completely. Agatha Christie was my choice for the English leg of my reading challenge, but I found it doubtful that I would encounter more detective fiction along my global journey. Imagine my delight when I discovered a list of detective fiction from around the world. One of these was Singaporean author Ovidia Yu, whose early 20th century-set The Betel Nut Tree Mystery was my book of choice for the island nation. Anyone who has ever read The Famous Five will be able to tell you that besides solving mysteries, it sometimes seems all those children and their dog do is eat. Blyton’s books are filled with endless mouthwatering descriptions of ice-cream at the beach, breakfasts fit for kings, and picnics straight from paradise. Yu, through the eyes and taste buds of her heroine sleuth Su Lin – as well as chef and friend Kaeseven – relishes the inclusion of food as well. What’s more, as I trot the globe through the stories and characters of people all over the world, food is one of the greatest insights into their cultures and customs. And, well, frankly, it’s delicious to read. From soy-sauce braised eggs and char siew to peanut brittle and candied tangerine peel in coconut cream, Yu makes your mouth water as much as Blyton ever did, while opening your eyes (or your mouth, rather) to a whole world of new flavours. Of course, it’s not all about the food. Yu perfectly pitches all the other mystery-making elements – whether it’s pace, suspense, supportive sidekicks, or meddlesome authority figures. Her settings also deliver with lavish hotel rooms and not-so-lavish headquarters, and is enriched by providing social and historical context. The best part is that, in classic detective-fiction style, this is not the last of Su Lin’s adventures.